I went to the cinema with mixed feelings. I had low expectations of the movie mainly because I found the scenario that was suggested in the trailer very silly. It seemed like a far fetched explanation of how we go from today, to the Charlot Heston dystopia of the mute primitive humans and the thriving Ape civilization. On the other hand, the movie was rewarded by a big round 8 on imdb which had to count for something. I was pretty sure that the movie was not an 8 but at least it would be enjoyable and interesting and I was right. In this dry period, of ridiculously bad summer movies, Rise of The Planet of the Apes seems like a good movie, or at at least, a respectable one that the people bored of all the crap of the past 3 months will give a high score to. This movie is more about characters than it is about action and this is a good thing 'cause when the action starts, about 2/3 into the movie, it feels necessary and well integrated. The movie is the story of an Ape, Caesar. Caesar is a special Ape. His mother was part of some lab experiments to cure Altzheimer's disease which resulted in Caesar having abnormally increased intelligence. This causes some rather interesting side effects in the psychology of Caesar who cannot really place himself as a pet but he also acknowledges the fact that he is not part of the human society. To that mix add many more apes, an advanced version a lab created virus and some stunning CGI effects and you got your self a good summer Sci-Fi mix. The special effects are brilliant. 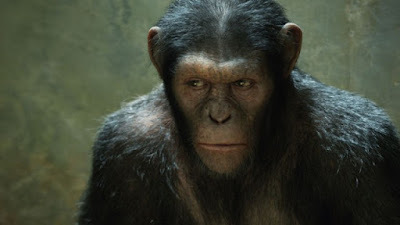 The people at WETA did some brilliant job bringing Caesar and the other Apes alive. Especially in the scenes where there are not human actors, you really cannot tell the difference. This is not a movie that will astonish you by its obvious use of effects though. It is about not letting the effects get in the way....not let the viewer think that it is CGI. This is really important in this movie since the protagonist is a a computer generated Ape. Caesar. Very convincing and brilliantly executed role. Andy Serkis was fantastic as Caesar but I am not really sure how much was acting and how much was 3d modelers working in front of the computer. So, I will just say that Caesar's character was fantastically assumed by whoever that was. I don't have anything important to say about the human actors since you really don't care about them throughout the course of the movie. Ok, James Franco did a good job as the lead human male of the movie but nothing special and you will not really care about him. At least I didn't. The rest of the actors just play their parts to allow the script to move on with nothing particularly bad or good about their performance, except from Tom Felton who played the, badly executed, exact same role of caricature bully he played on Harry Potter for that past 10 years. Over all I thoroughly enjoyed this movie. It is not the best movie of the year but it is a good Sci-Fi cinema experience. If you are a fan of the franchise you will definitely enjoy it. The movie contains countless references to the original franchise with names and quotes. On the downside there are 2 scenes were Caesar does something which I consider a very bad choice from the filmmakers because it almost ruins the experience, at least to me, since it is scientifically impossible. When you see/hear it, try to go past it to enjoy the rest of the movie. Oh, and at the end, don't leave the cinema immediately because the credits include some further explanation to how we got to the dystopian future. I though the exact same thing before watching it but I kept hearing good things so I finally went and I did not regret it. Rumor has it that this will be the start for a new franchise leading us to the dystopian future of the original film. Saw it finally - it was quite good, I would also give it a 7/10. James Franco was pretty horrible as the lead, but the plot development was interesting, the action integrated and Serkis' (?) performance great.